A Vietnamese proverb about a mouse sticking his head in the mouth of a large carnivore may, at first consideration, seem a strange way to view our lives as life-long learners. One interpretation of the Vietnamese proverb is to value life because we never know when we’re about to lose it. In other words, enjoy the present. That view, offered up by WikiAnswers.com, is exceptionally shallow and even misleading. A more useful interpretation of this proverb, when seen in the context of life-long learning, is that of a multi-layered metaphor symbolizing the challenges–and changes–ahead for all of those seeking a life that gains meaning through significant personal growth and intellectual maturation. If we “reverse engineer” (work backwards from the product to deduce the process), we find ourselves asking rhetorical questions based on the most important word in our language: Why? Why does the “story” begin with the mouse having been to the cat’s mouth? Why would the mouse put him/herself in such a suicidal position? What were the motivations behind the action? Was it rational or was it irrational? How did the mouse escape the cat? We ask such questions out of curiosity, but also because we need answers to better understand the real value of this proverb–to focus less on the journey and more on the destination. What is the Truth? What really happened to bring the mouse and the cat together. What miracle led to the mouse’s escape? Presumably, a wiser mouse, one with valuable lessons to impart to his/her fellow mice about cats and how one’s life changes after such an encounter. Why do we need to see and learn the Truth as a new meaning for the proverb? Why not just be satisfied with the earlier interpretation that the proverb meant to simply enjoy life? Perhaps, if we see the “mouse” as Everyman, and the “cat” representing life’s developmental journey, then the metaphor suggests that long-term survival will depend on finding out the Truth–“the rest of the story,” as journalist Paul Harvey often explained. An appropriate analogy can be offered here that long-term “thrival” in the journey through the stages of our lives will depend on an unswerving commitment to finding the Truth about ourselves, how we view the meaning of our lives, and what we see as our destiny. As a metaphor about a significant life experience, albeit an anthropomorphized mouse, the proverb has much to offer those whose future success depends on applying “critical thinking.” If it were an onion, it would have many layers to peel. Historians and researchers understandably place a great deal of importance on “primary sources.” When we consult the original primary source–a good dictionary in this instance–for the phrase “critical thinking,” we can establish an important etymological foundation for understanding its relevance for all of us. The word “critical” traces its origins to Greek (kriterion, a means of judging) and krinein, to separate or choose. In fact, the origins begin in Indo-European with the term “skeri” meaning to cut, separate or sift. (The American Heritage Dictionary of the English Language, 1981) These roots provide a better understanding for the evolution of our word, critical. The term “critical” can and often is used to mean an inclination to judge severely. However, it has many more nuances and meanings that apply to us at this stage in the doctoral journey. For example, the phrase “critical thinking,” should include the following meanings and core values (operationalized into behaviors) that reflect careful and exact judging based on thorough knowledge through detailed investigations–often accompanied by published arguments articulating the reasons and rationale behind the assessment. consistency with fact and reality. Intellectual courage is often tested. Certainly, a fundamental honesty and commitment to fact-based decision making and interpretation is a necessity. Otherwise, more of Russell’s myths will be the likely outcome. “The weakness of a soul,” pointed out author Eric Hoffer, “is proportionate to the number of truths which must be kept from it.” As Gabennesch (2006) in “Critical Thinking: What Is It Good for? (In Fact, What Is It? ),” outlines the sharp and dangerous decline of critical thinking in America–to the level of disagreement as to its very definition–he points to what could be seen as a dangerous, collective weakening of the souls in most Americans. If “critical thinking” is the application of rigorous scientific principles where they can be applied, does the evidence suggest that the search and articulation of truth in the social sciences is being subordinated to other priorities and agendas? Is the lack of objective “truth” in the social sciences as risky and dangerous as it is in the “pure” sciences? Is it harder (more nuanced?) to find “truth” in the social sciences, so vulnerable to being overwhelmed by the sheer volume of variables inherent in studying humans, their psychology and sociology? As a dedicated student of life you should internalize the concepts and processes of critical thinking since only by doing so can you expect, after significant effort and application, to reach approximate Truth– a worthy, ultimate goal for all of us. Life is an expedition through uncharted territory with dangers and pitfalls which can most successfully be negotiated by applying the principles of critical thinking. For many, there will come a time, perhaps more than once, when it seems as if they were the proverbial mouse having its head in the cat’s mouth. Is not critical thinking the key to a successful escape from the “lion’s den”? Once out of the “shadow of the valley of death,” will the endorphins kick in and we find that we will, henceforth fear no evil? Having survived the trials, will we find life especially meaningful? The “mouse in the cat’s mouth” proverb can also be seen as an implied metaphor–applied to our quests for degrees and certifications–for the universal “theme of initiation” monomyth. As explained by Joseph Campbell (1973), the initiate Hero, departs the normal world, seeks supernatural assistance, faces a road of trials, reaches an intellectual apotheosis having reached the fount of knowledge and imbibed deeply. Finally, the goal is reached–the ultimate boon–the journey from novice to craftsman is complete. The metaphorical lesson: the advanced learner and seeker who applies critical thinking rigorously and at times unflinchingly in the face of dangers and pitfalls, will earn the ultimate boon, the achievement of the degree, but more importantly, the boon of advanced competence in finding Truth. Further, mastery of a field, or a competency within that field, offers a degree of freedom from “death,” and therefore confers the freedom to live more fully. Perhaps following the yellow brick road will be worth it after all, said the mice that roared. Perhaps the first interpretation of the proverb has validity here, as well. Bensley, D. Alan. (Jul/Aug 2006) Why Great Thinkers Sometimes Fail to Think Critically. The Skeptical Inquirer, Vol. 30, Issue 4, pg. 47. Campbell, Joseph (1973) The Hero With A Thousand Faces. New York: Princeton University Press. Gabennesch, Howard. (Mar/Apr 2006) Critical Thinking: What Is It Good for? (In Fact, What Is It?). The Skeptical Inquirer. Vol. 30, Issue 2, pg. 36, 6 pgs. Perspectives on Ethics: When I am vulnerable, can I trust you? Is it ethical can often be determined by asking: when I am vulnerable, can I trust you? Hosmer (1995) traces the fundamentals of ethics to a variety of social theories that deal with an individual’s need to feel secure – to be comfortable in approaching interactions with others, particularly dependent interactions, and trust in a favorable outcome. When people trust, they willingly increase their vulnerability to the actions of others whose behavior is beyond their control. When people trust, they consciously regulate their dependence on someone else in various ways depending on the person, the task, and the situation. In other words, when we trust we except our vulnerability and dependence on the actions of others because a greater good is expected to be attained. reliability (their willingness to protect and support our interests, to do so willingly, and to freely share ideas and information). The process of elaborating upon and acting according to our value structure, i.e., ethics, represents values in practice, as well as the assessment and critique of values. When values, responsibilities, or rights, are in conflict, an ethical dilemma can present itself (Mitzen, 1998). Ethics is a process that includes analyzing and assessing those components used to define and justify morality in its various forms, e.g., logic, values, beliefs, and principles (Cooper, 2006). Ethics considers the articulated or mandated moral code and examines it to better determine its meaning and purpose. Ethics attempts to explain and assess moral conduct through systematic reflection and reasoning (Cooper, 2006). Descriptive ethics attempts to identify and explain the underlying assumptions and connections to conduct. Normative ethics articulates supportable cases and arguments for particular conduct in a specific situation (Cooper, 2006). Ethics has two essential orientations: deontological (duty to uphold ethical principles without regard for the consequences of one’s actions); and, teleological (concern for the consequences or outcome of one’s conduct). As Cooper (2006) points out, ethics should involve a more systematic consideration of the values and principles that effect the choices we make, their consistency with our duties, and the incident consequences toward which they lead. A dilemma (from Greek, ambiguous situation), apparently forces us to choose between two, often contradictory, alternatives. I say “apparently,” since a reasoned, deliberate and orderly assessment of the issue can often produce different alternatives, much better suited for solutions or resolution. As an aside, this form of false or fallacious reasoning – is known as false dilemma (or false dichotomy, fallacy of bifurcation, or black-or-white fallacy). • that involves a situation where the manager or leader wants or intends to do the right thing, but may not know what the proper course of action may be or how to accomplish it (Meneghetti & Seel, 2001). The authors outline a four-step ethical decision-making model in which: the primary stakeholders are identified; the problem is addressed from the point of view of each of the identified stakeholders (including the key ethical values being violated); actions determined that should be taken given each stakeholders concerns; and, a decision finalized once the positive and negative consequences of each action are better known. The objective, they explain, is to choose the option that, on balance, minimizes harm, reduces negative consequences, and produces the greatest balance of good in the long term (Meneghetti & Seel, 2001). In my view, both models could be strengthened by incorporating their relevant steps into a rational model that suggests a more nuanced process. The following model represents an ethical decision-making process incorporating the views of both Cooper and Meneghetti and Seel (2001). Typically, we can identify three major areas where ethical problems can arise, according to Mitzen (1998), including: business practices; employee relations; and, interactions and relations within the larger community or external operating environment. Ethical behavior toward its own staff and volunteers should be a foundation and a given for any nonprofit organization. This includes meaningful communication, and a supportive environment where even whistle blowing, with its inherent potential for divisiveness and conflict, is seen as an expression of several fundamental core values, e.g., responsibility to the publics being served. Organizational core values should be clearly articulated, and clear policies developed as to how they are operationalized. Nonprofit organizations should have “organizational ethics mechanisms,” that identify how the organization educates its people regarding ethics related issues and how it integrates ethics into its operations and organizational structure (Mitzen, 1998). Cooper (2007, p. 31) introduces his readers to a five-step ethical decision-making model, the objective of which is to challenge us to think about what is needed to move from an ethical problem facing us, to a reasoned, orderly, sequential course of assessment and analysis intended to resolve or solve the challenging issue. His model represents a framework through and by which a determination can be reached and a rational, fact-based decision achieved for the most promising course of action. The author correctly points out that no on model can provide the single best possible or “correct” solution. It can however, provide a template through and by which the problem is assessed, evaluated, and converted into an opportunity to creatively designed “the best solutions for a given individual in a specific situation within the uncertainties and time limits of real administrative life” (Cooper, 2007, p. 30). Rather than accept Cooper’s ethical decision-making model as the definitive illustration for the steps in ethical decision-making process, we should remember there are a wide variety of potential models suggested proposed for decision-making, in general. 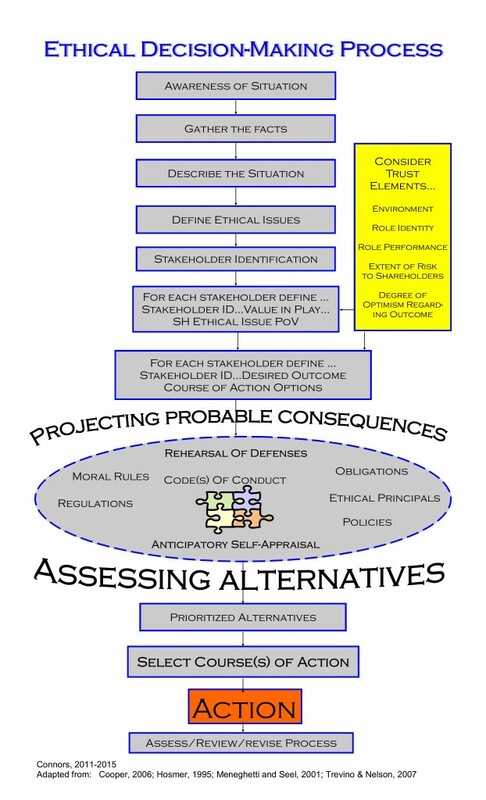 Depending on the situation, those faced with an ethical issue or dilemma might well consider using Cooper’s model and others as guides that can be adapted to the situation, producing a more specific and situationally focused ethical decision-making model. As McDermott (2011) points out, there are a number of decision-making models from which to choose. The manager even has to make a decision as to the one best suited for the situation, e.g., rational models, intuitive models, rationalist-iterative models, as well as models that have been suggested in a variety of “steps.” Cooper’s model most closely resembles the six-step, rational decision-making model that includes the following phases: define the situation and the desired outcome; research and identify options; compare and contrast each alternative and its consequences; make a decision or choose an alternative; design and implement an action plan; and evaluate results (McDermott, 2011). The term “role” has its origins in medieval Latin and the word ro(tu)lus, a roll of parchment, that in turn was derived from earlier Latin rotulus, a small wheel. In the Middle Ages the part or character played by an actor in a dramatic performance was written out on a rolled up parchment or paper. The part soon became associated with the means used to describe and explain what the character did in the performance–a role. Keeping the etymology of the term in mind helps us better understand the meaning and implications of the term as it is used today. Luthans (1995) explains that a norm – the typically unwritten but generally understood rules of a group, culture, or society for behaviors that are considered not only acceptable, but expected – represents the “oughts” of behavior. Collections of norms represent prescriptions for acceptable behaviors expected by, and sometimes determined by, the group. A role consists of a defined set and pattern of norms associated with a position (defined or undefined but “understood” by the group), that is filled or acted out by an individual. A role can perhaps best “be defined as a position that has expectations evolving from established norms” (Luthans, 1995, p. 380). A role is an organized set of behaviors identified with a position, Mintzberg (1975) explained. He noted that formal authority is the basis for three interpersonal roles, leading to three informational roles. Together, the interpersonal and informational roles provide the tools to play four decisional roles. Interpersonal relationship roles, include: figurehead role (ceremonial duties); leader role (responsibility for the work of the people in the unit–hiring/firing, motivation, encouragement); and, the liaison role (contacts outside the immediate work unit). Informational roles, include: monitor and disseminator (collecting/disseminating soft information for his unit/organization); and spokesman (collecting, positioning, and sharing information with outsiders. Decisional roles include: entrepreneur (identify new ideas and pursuing opportunities that advance the organizational unit’s objectives); disturbance handler (responding to changes and pressures affecting performance of the unit organization); resource allocator (decisions relating to allocations of resources and the empowerment of subordinates decisions and program contributions). Collectively, Mintzberg (1978) suggests the managerial role represents a gestalt – an integrated whole greater than the sum of its individual parts. The managers performance depends directly on the extent to which he or she understands and effectively response to the demands and dilemmas of the position. Although often tempted by the short-term benefits of “busy work”, managers should resist the pressures of superficiality by giving serious attention to those issues that require it by keeping the broad picture in mind and by using a variety of analytical inputs” (Mintzberg, 1978, p. 60). The term we use to describe the worth of an object or concept – its monetary status, desirability, usefulness, importance to the possessor, utility, or merit – is “value.” The term can be traced back to its Latin roots of “valere,” to be strong, to be of value. It can even be traced back to the Indo-European language, from which so many of our present day languages originate, where it meant “to be strong,” “to rule,” “force,” or “power” (Morris, 1981, p. 1415). Values typically refers to those “strong and enduring beliefs that motivate and define behavior. Values inform the choices we make. They are a statement of what is ‘good’ for individuals and for society” (Mitzen, 1998, p. 103). Values define those things we believe in, and what we consider important in our life and work. Meneghetti and Seel ( 2001) point out, values represent strongly held attitudes and beliefs regarding what is desirable. However, not all values necessarily have an ethical component, e.g., power per se is neither good nor bad. Those values not having broad societal implications and that are typically held private are considered morals. These attitudes and beliefs held by individuals regarding what is worthwhile or good, are derived from and influenced by family, culture, society, and religion. Typically, public values are considered ethical values, more universally accepted beliefs about what is right or wrong. Each role “comes equipped” witha set of values attached that reflect guidelines to behaviors expected for those “playing” that part, e.g. leader value of “cheerleader” (motivator). Discrimination represents an important ethical issue and problem in the workplace due to its corrosive effect on perceptions of fairness. When the workplace is not fair, ultimately our entire legal system promising justice and protection of individual rights is in jeopardy. Many case studies reviewed by students outline possible cases of de facto discrimination that could rapidly devolve into the condition known as a “hostile work environment.” Further, the conditions as outlined in some case studies, if valid (not simply perceived) could meet the requirements for an official investigation, followed by official action. Values conflicts presented as ethical dilemmas will certainly face all of us as managers from time to time, and there may be no completely satisfactory resolution. This eventuality must not be used to rationalize their moral or unethical behavior. Codes of ethics, although helpful, cannot be depended on to solve all values conflicts. In fact, some may use them to appear to “stay within the law” while actually infringing on truly ethical conduct. Unethical actions can really be hidden and self enforcement helps insulate the manager and the organization from external scrutiny, or enforcement. Finally, as leaders and managers of our respective organizations, we have a personal and professional interest in being alert to potential ethical dilemmas in situations, and to employ an orderly ethical decision-making process to seek effective resolution. Morals or morality, originating from the Latin word for “custom,” typically refer to those judgments and characteristics of our actions that can be defined according to our core values as good” or “bad/evil.” Morality is assessed using various standards or precepts of goodness or codes of behavior. Morality represents a set of customs within a society, class, or social group that attempt to regulate relationships and prescribed behaviors that enhance the group’s survival (Morris, 1981, p. 853). Morality is based on presumption of what is an accepted mode of behavior that is established or provided by an authoritative source, e.g., religion, culture (including that within a group organization), social class, community, or family (Cooper, 2006). The Greek term for a moral custom was ethos, a meaning which has expanded for hundreds of years to now include a principle of right, correct, or good conduct, including a body of such principles. Ethical came to mean a practice that was conducted within the accepted definitions of right and wrong, and governed the conduct of the group. Ethics represents the general study of morals, including the rules or standards by which the conduct of a group or profession are evaluated and judged (Morris, 1981). Organizational codes of conduct – ethical standards – can be seen as articulations and declarations of core values and acceptable behavior on the part of the individual or organization that its actions and decisions can, indeed, be trusted. Applied to ethics, Hosmer (1995) suggests that trust is the result of behavior that recognizes and protects the interests of others – the overriding goal being to increase cooperation and achieved benefits within a joint endeavor or exchange. Trust is a relationship in which some personal or organizational vulnerability is accepted because our analysis suggests a collective, general optimism is justified in a mutually beneficial outcome based on expectations or conditions of moral (socially expected and /or defined as acceptable) behavior. Codes of ethics and conduct such as those endorsed by APA, represent the standards of practice supported, espoused, and directed by that organization. The codes delineate and outline the collective values of that professional organization, and typically cover a number of ethical areas and considerations. Most codes of ethics and conduct include two major components, including: definitions and explanations for recommended or mandatory professional behavior on the part of those professionals practicing in that field; and, what Kocet (2006) explains is encouragement regarding ethical reflection to help clarify and improve the fundamental ethical beliefs held by that profession. The human services nonprofit organization for which you serve as the Executive Director, has recently lost the source of revenue on which the organization depended to fund the volunteer resource manager position. In an effort to balance the organization’s budget before reaching a dangerous state of insolvency, the organization’s personnel committee, comprised of three members of the Board of Directors, has met and is prepared to recommend the termination of the paid staff position of volunteer resource manager, in favor of replacing that staff member with a volunteer. Their loyalty to the organization and their sense of fiduciary responsibility, represent important core values in play. Loyalty to the organization, loyalty to staff, fairness, professionalism, teamwork, integrity, and mutual respect are among the core values initially identified as important to senior staff members. Security, fairness, loyalty, professionalism, are all expected core value issues with the staff member most directly affected by the committee’s recommendation. There are other potential stakeholders that could be considered in this explanation, e.g., the organizations volunteer corps, the membership, clients depending on the volunteer services, and the community at large. The Board of Directors feels a primary responsibility to their fiduciary duties and seeks an outcome of a balanced budget. The senior organizational staff are quite concerned about the negative ramifications of a pending termination on the organization’s morale and esprit de corps, its operational effectiveness in light of a change in volunteer management from seasoned professional to an individual lacking equivalent training, and the devastating economic consequences to the soon-to-be former volunteer resource management professional. The senior staff would prefer to retain their colleague and to ensure the continuation of the organizations exemplary record in human services delivery through its effectively managed volunteer resource program. The volunteer resource manager, although not yet aware of the pending recommendation from the committee, can certainly be expected to be devastated by the news. The potential for “political” fallout from the individual should be considered significant. Clearly, their desired outcome would be that the issue never presented itself in the first place, and that they be retained in their present position. Selected course of action: following a confidential meeting of the senior staff in which the situation was reviewed in great detail in terms of ethical principles, moral rules, and potential ramifications, the senior staff voted to accept a temporary 5% pay cut to ensure the continuation of the volunteer resource manager until additional funding sources could be identified. The group decision unified the staff around a common purpose, reaffirmed important core values for them and for the organization, and upheld the Board of Director’s fiduciary responsibilities, including the continuation of a balanced budget. One approach to achieving better understanding of an emerging trend is to do so within what could be seen as an historical perspective or framework. In this case, the baseline for the framework is the publication in 1980 of the first Nonprofit Organization Handbook (Connors, 1980). 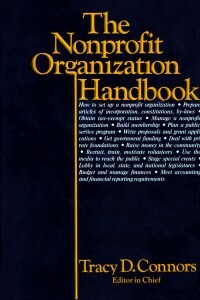 The handbook was organized around the premise that regardless of the specific human service provided by a nonprofit organization, all shared seven fundamental areas of management, including: organization and corporate principles; leadership, management and control; sources of revenue; human resource development and management; fiscal management (budgeting, accounting, and record-keeping); and, public relations and communications. A review of the index for this first edition reveals a single entry under the category “ethics.” The context in which it was used within the book was an observation that “a growing number of nonprofit organizations now employ a professional manager, a full-time paid employees and supervisors and is responsible for the daily routine business of the organization” (Connors, 1980b, p. 2-70). The single reference to ethics and this major handbook appeared when the author noted that the area of managing nonprofit organizations has become a profession itself “with its own high code of ethics and standards” (Connors, 1980b, p. 2-70). Over the next 21 years five subsequent major handbooks focused on nonprofit organization management were published, the latest in 2001 (Connors, 2001). A review of the index for this volume offers a startling contrast to the first NPO handbook. The subject of ethics appears throughout the book with multiple page coverage focused on ethics in all aspects of managerial behavior and policy, including: behavior; budgeting; compensation practices; fundraising; human resource management; international business; and, numerous mentions of professional codes of conduct. An entire chapter is devoted to “Ethics and Values in the Nonprofit Organization” (Meneghetti & Seel, 2001). Clearly ethics is now understood to be a critical component of NPO management and decision-making. Dr. Joan Pynes contributed a most important chapter to the The Volunteer Management Handbook (Second Edition), entitled, “Professional Ethics for Volunteers” (Pynes, 2011). The author points out that to survive nonprofits must maintain public trust. One important component of that collective trust is based on paid staff and organizational volunteers fulfilling their responsibilities in a lawful, ethical, and competence manner. This objective far exceeds simply complying with formal controls, program reports, and financial audits. Instead, it is vitally important that nonprofits establish an aspirational internal ethical climate. Pynes (2011) recommends that NPO managers establish a strategic human resource management program that uses defined and formal systems within the organization to ensure the most effective use of staff and volunteer resources to fulfill the organization’s mission. 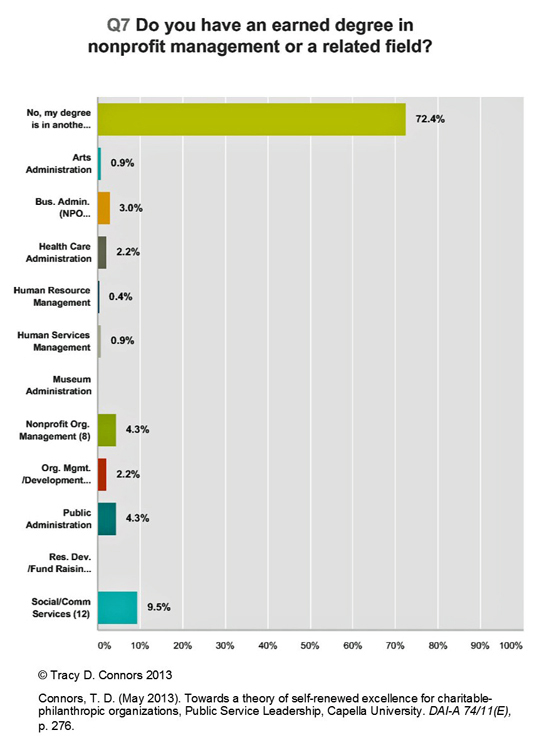 There is no doubt the nonprofit sector currently faces many daunting challenges. 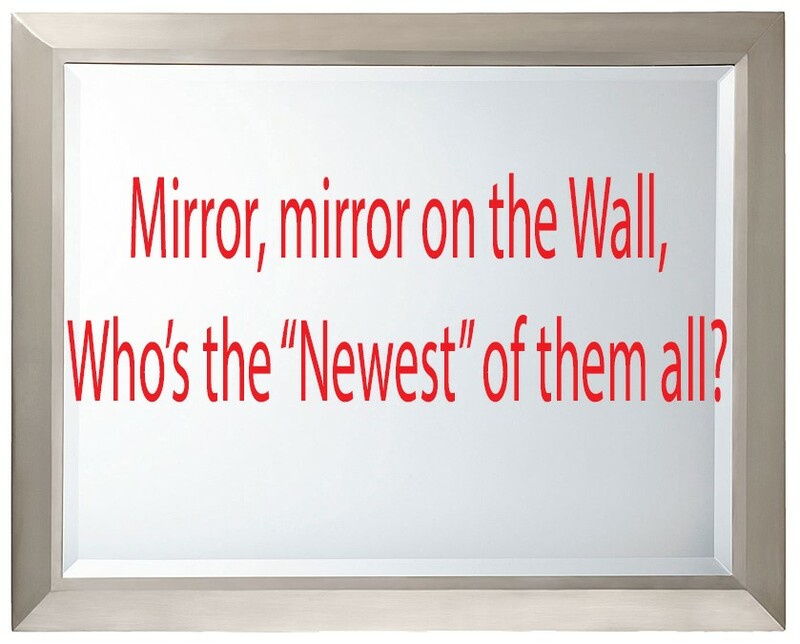 Nor is there any doubt that new problems and changes within external and internal environments will constantly present themselves to all of our managers and leaders. The people on whom our nonprofits depend to fulfill our organizational missions, are highly affected by the cultures we establish within which they must participate and contribute. Clearly articulated values, ethical principles, and codes that explain how our ethics are interpreted and used for action and decision-making, are highly significant –they define our culture and the relationships between those who were members of that culture. When inevitable ethical dilemmas present themselves, the successful NPO executive will know to follow a well-defined ethical decision-making process to find the best possible solution or resolution. Connors, T. D. (1980). The nonprofit organization handbook. New York: McGraw-Hill. Cooper, T. L. (2006). The responsible administrator: An approach to ethics for the administrative role (5th ed.). San Francisco, CA: Jossey Bass/Wiley. Kocet, M. M. (2006, Spring). Ethical challenges in a complex world: Highlights of the 2005 ACA Code of Ethics. Journal of Counseling & Development, 84(2), 228-234. Luthans, F. (1995). Organizational behavior (7th ed.). New York, NY: McGraw-Hill. Meneghetti, M. M., & Seel, K. (2001). Ethics and values in the nonprofit organization. In T. D. Connors (Ed. ), The nonprofit handbook: Management (3rd ed.) (pp. 579-609). Hoboken, NJ: John Wiley & Son. Mintzberg, H. (1975, July). The manager’s job: Folklore and fact. Harvard Business Review, 53(4), 49-61. Mitzen, P. (1998, Fall). Organizational ethics in a nonprofit agency: Changing practice, enduring values. Generations, 22(3), 102. Morris, W. (. (1981). The American heritage dictionary of the English language. Boston, Massachusetts: Houghton-Mifflin Company. Trevino, L. K., & Nelson, K. A. (2007). Managing business ethics. Hoboken, NJ: John Wiley & Son. Transformational Leaders or Paragon Leaders? Is the “paragon leader” construct what we will need in order to grow voluntary sector capacity and improved organizational performance to the levels it will take to sustain our nation’s quality of life as the future becomes the present? Transformational leadership is a construct proposed nearly 40 years ago that identified characteristics associated with successful leaders. The transformational leader construct has remained a mainstream issue and a highly popular subject for nearly 4 decades. The original construct has evolved into at least eight major categories of leadership theories, with the “great man” theory being the most frequently used. While most leadership theories focus on personal leadership dimensions and attributes, far fewer directly consider the organizational environment in which the change is expected to occur, and none currently address factors relating to the purpose of leadership – the change that drives the activity and the behavior. Some of the theories overlap or are parallel. Leading involves changing, and that always has consequences, some or even many of which are not always positive unless the change process is prudently undertaken after due diligence. In trying to find the most effective theory and model for change leadership adequate for demanding times, laudatory traits and characteristics have been steadily added. The idealized construct now represents a paragon of exemplary behavior based on fully develop sets of impeccable core values that represent the most humanistic principles ever gathered. As the list of “saintly” attributes that are supposedly required by “real leaders” has grown, it has become a more daunting for mere mortals to achieve and practice but now appear to be saintly qualities successful leaders are said to have or be needed for success. But is this “paragon leader code of conduct” what we will need in order to grow the capacity and improve organizational performance to the levels it will take to sustain our nation’s quality of life as a future becomes the present? 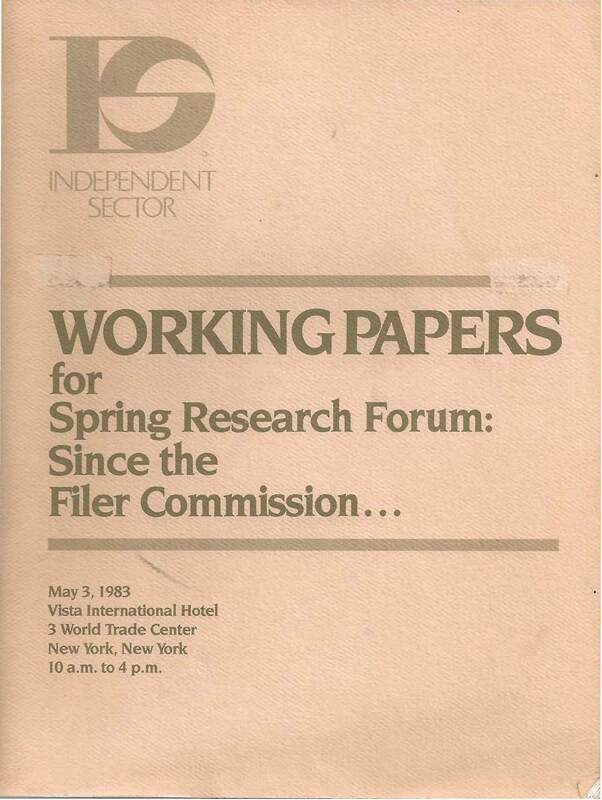 In 1983, Independent Sector sponsored “Since the Filer Commission,” a research forum conducted in New York, ten years after the Commission on Private Philanthropy and Public Needs had concluded its two-year study into private philanthropic initiatives. The Filer Commission had published its report, Giving in America: Toward a Stronger Voluntary Sector, in 1975. 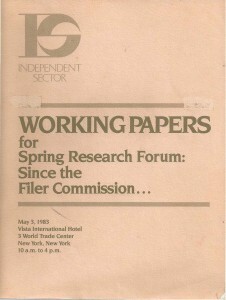 Sector leaders (including Kathleen D. McCarthy, Pablo Eisenberg, Russy Sumariwalla, Elizabeth T. Boris, Lester Salamon, Jon Van Til, Landrum R. Bolling, and Tracy D. Connors) were asked their opinions regarding: the accuracy of the original commission’s report: about research that had been expanded or continued since the commission had reported 10 years earlier: identification of new issues, new research, or lingering questions still unanswered; and, where did the sector go from that point. 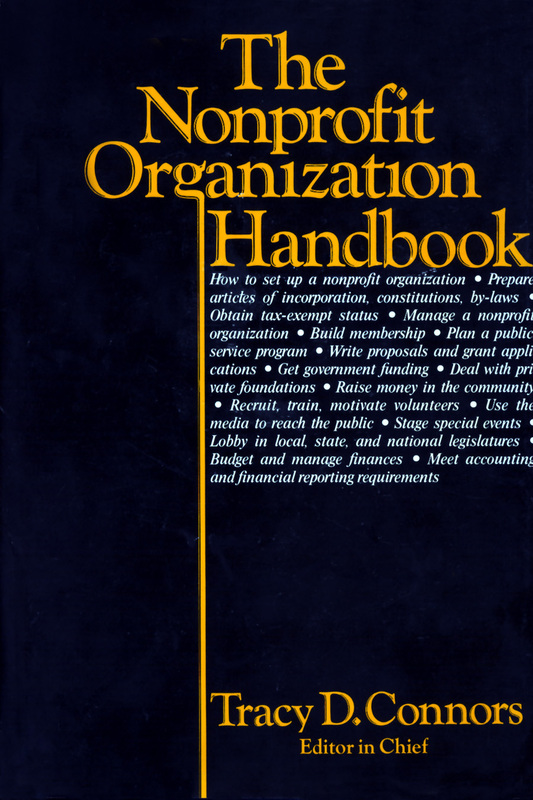 Connors had published the first Nonprofit Organization Handbook in 1980. The Nonprofit Organization Handbook established for the first time that regardless of the specific public service provided, not-for-profit organizations shared seven areas of management—from fund raising to volunteer administration. The first and second editions of the Nonprofit Management Handbook compiled the fundamental management information needed by NPO leaders in one volume for the first time. The NPOH pointed out for the first time that while not-for-profit organizations may differ greatly in the type and variety of the public services they provide—e.g. culture versus social services—nevertheless, they generally share seven important areas of management and operations. As Connors pointed out in his IS presentation and published perspectives, nonprofit organizations, regardless of the type of public service they provide, shared basic management commonalities, e.g., leadership, management and control; human resources management; revenue and support generation; financial management; public relations, marketing and communication; organizational and corporate principles; and, legal and regulatory impacts. While nonprofits exhibit major differences in terms of their public services, in management areas they share much more than they differ. The early 1980’s introduced the first comprehensive handbooks for charitable-philanthropic organization management, and established the basic horizontal management model which exists to this day around which management education in this field is organized. A new management professional had evolved to lead C-POs regardless of their public service: the nonprofit executive. How myths, stereotypes and prejudice fuel ageism–the Golden Years through a glass darkly. I cannot see, I cannot pee. I cannot chew, I cannot screw. My memory shrinks, my hearing stinks. No sense of smell, I look like hell. The Golden years have come at last. A “mythos” to the ancient Greeks, was “speech” or “discourse,” but over time the word evolved into meaning “fable” or “legend.” As a story of vague or forgotten origin, often religious or supernatural in nature, a myth is often used to “explain or rationalize one or more aspects of the world or a society” (Doyle, 1997). Typically, myths are actually believed to be true or basically so by those people or societies that used or originated them. By attempting to explain or rationalize some aspect of human existence or institutions, myths served purposes similar to science, religion and history. To understand a people, a culture, one must attempt to know and understand the myths of that culture. By acquiring that understanding, we not only better understand the present, but we can use that understanding to move in the direction of a better future. When a myth is repeated and “passed along” throughout the various communication channels used by a society, e.g. news media, internet, blogs, periodicals, it is well on its way to becoming a stereotype–a commonly held, often standardized and simplified concept that has been invested–or charged–with special meaning (Merriam-Webster, 2009). A stereotype is often used in a prejudicial way, particularly when it involves beliefs directed at a person or category of people involving such characteristics as gender, disability, sexual orientation or age. Aging and the aged have long been the subjects of–and many might say, targets of–myth-makers or myth-conveyers in many societies. A recent Google search on the topic “myth” + “aging,” almost instantly generated About 23,000,000 results (0.49 seconds) or “hits.” If a myth serves to explain or rationalize attitudes and aspects of a society, then a review of common myths about aging offers a sad commentary on our contemporary society. Of greater concern is the extent to which misleading myths help perpetuate fallacious stereotypes that are used to make, shape, or alter, public policies and benefits affecting “senior citizens”–fostering ageism. More than half the people who ever lived to be 65 are alive today, according to Jeanne Sather, who writes on Healthline that myths on aging should themselves be retired. “That alone suggests that myths about aging based on past generations may not hold true for this one.” (Sather, 2008) Wishing a myth away is not supported by research. When we contrast common myths held by our society about aging with scientific fact, we can understand how Drs. John Rowe and Robert Kahn can reach the conclusion “that our society is in persistent denial of some important truths about aging. Our perceptions about the elderly fail to keep pace with the dramatic changes in their actual status. We view the aged as sick, demented, frail, weak, disabled, powerless, sexless, passive, alone, unhappy, and unable to learn—in short, a rapidly growing mass of irreversibly ill, irretrievable older Americans. To sum up, the elderly are depicted as a figurative ball and chain holding back an otherwise spry collective society.” (Rowe & Kahn, 2009). This summary, by the authors, reflected over ten years of research by the MacArthur Foundation Study of Aging in America. myth #1: To be old is to be sick. myth #2: You can’t teach an old dog new tricks. myth #3: The horse is out of the barn. myth #4: The secret to successful aging is to choose your parents wisely. myth #5: The lights may be on, but the voltage is low. “When people think of growing older, they often have images of deprivation, poverty, poor health, loneliness and loss of mental capacity,” Dr. DeLee Lantz points out in the introduction to a National Institute of Aging of the National Institutes of Health questionnaire (Lantz, 2009). Are views held by many likely to be accurate? How true are stereotypes? Are many views about aging and the aged actually myths that are accepted because of repetition? An objective comparison of frequently held myths about aging reveals a significant gap between the myth and scientific fact. While most of these myths cannot be sustained when compared with scientific findings, the myths persist. A better understanding of myths related to aging and the degree of their truthfulness is gained by organizing them into three overall categories, including those related to: attention, memory and perception. It should be remembered that these selections represent a very small fraction of age-related myths and stereotypes. Limited data are available on attentional deficits related to aging. Some cognitive slowing may occur, perhaps due to neural connection loss or loss of information during processing (Cavanaugh & Blanchard-Fields, 2006) However, people at any age can acquire new skills and information. Older people have more mental problems, e.g. learning, remembering or concentrating. Nearly five percent of the general population have problems with learning, remembering or concentrating. Of those from 65-74 (10.8%), 75-84 (6.3%), and 85 and older (27.7%) have such problems or issues (Gist & Hetzel, 2004, p. 11). Only the very elderly have significantly greater issues with learning, remembering or concentrating than the general public. Older people are more subject to variations in heat or cold. Extremes of heat or cold are more threatening for older people. True, generally, the body’s thermostat is less efficient as we get older. Most older people are depressed. Fact, most older people, according to the National Institute on Aging, are not depressed. When it does occur, it can be treated. Most older people are deaf or having trouble with their vision. Over one-third of those over 85 have sensory disabilities, including blindness, deafness or hearing impairment, according to the U.S. Census Bureau. (Gist & Hetzel, 2004, p. 11). However, only 8.7 percent of those 65-74 and 16.9 percent of those 75 to 84 have such disabilities. The “myth” has broader factual support for the very elderly. The negative effects of ageism on the elderly reach much further than depression, they are thought to reduce life span, as well. For example, in its impressive “Ageism in America” report, the International Longevity Center notes that “older people with positive perceptions of aging lived an average of 7.5 years longer than did those with negative images of growing older.” (Bernstein et al., 2006, p. 61). More significant overall is the impact on public policy of myth and stereotypes about the elderly. Too often it is the myths, not the facts, that become the foundation for public policy formulation, a process that may well be currently underway in Washington with the Medicare system being revised in ways that can only result in decreased resources and access for millions of American seniors. Stereotypes persist and resist efforts to combat them with facts, as Tornstam reports in a Swedish study conducted over 23 years. “Little seems to have changed for the better,” he concluded. (Tornstam, 2007, p. 1) However, negative characterizations can be “reversed to ‘positive’ stereotypes at the same time as negative stereotypes of psychological conditions remain the same.” (p. 23) He outlines a new stereotype in Sweden of wealthy, fit and spoiled “pensioners,” who are being characterized as being greedy for staying in their own homes too long; thus, denying the scarce (in Sweden) private housing to younger people. Sociologists, gerontologists and other enlightened leaders in society are attempting a more pro-active strategy of introducing new metaphors. Bernstein, C., Dennis, E. E., Grossman, L. K., Levy, B. R., McCann, L. A., Rix, S. et al. (Authors). (2006). Ageism in america, Anti-Ageism taskforce (International Longevity Center, p. 121). Cavanaugh, J. C., & Blanchard-Fields, F. (2006). Adult development and aging, fifth edition. Belmont, CA: Wadsworth, Thomson Learning. Haslam, A. A. (2004). Stereotypes. In A. Kuper & J. Kuper (Eds. ), The social science encyclopeadia (3rd ed.). New York: Routledge. When our goal is understanding, it is generally a good rule, if time permits, to explore the foundations – the roots – of the concept and principle. Often, we find those explorations, similar to the actual roots which we use as a metaphor, lead us in directions and with twists and turns that were unexpected, but interesting and insightful for our purposes. As the proto Indo-European language branched and fragmented and evolved and was mixed and remixed throughout Europe and beyond, “pet” had been applied in new situations. By the time it had reached Latin many centuries later, it had expanded its meaning to convey the sense of going forward, therefore, seeking. By combining com- and petere, the meaning broadened into asking for, seeking, pursuing, or striving to gather. Competere continued to be used and its meaning broadened as it made its way into English through Old French and then Middle English. 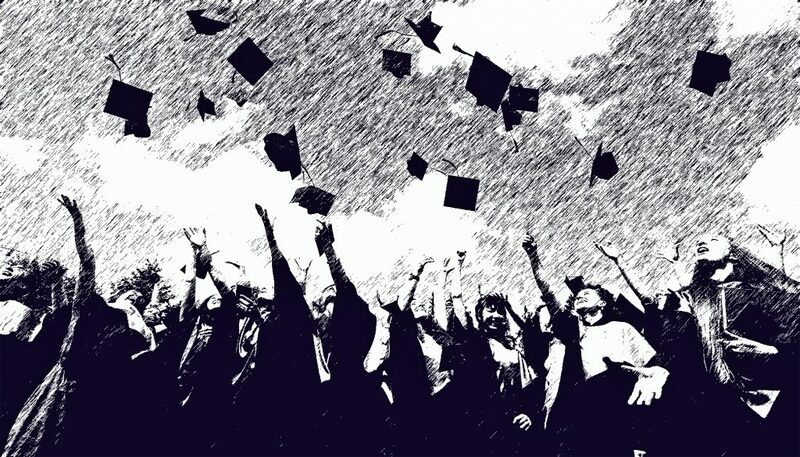 Today, in general, competent conveys meanings which include to be capable of (suitable, adequate, qualified) of striving with others, together in the same activity, as in a contest, match or trial of skills or abilities in which the outcome is measured in terms of success or achievement. When we are after the same thing, and doing so with others, we are seeking and striving together. We are said to be in competition with others when we are seeking, generally or specifically, the same thing(s), e.g., a job, a promotion, a mate, a goal. Competent is the term we most likely have in mind when we want to convey the meaning of capable or qualified, adequate, suitable or sufficient for the purpose – in short, to be prepared for the challenges of striving with others in the same basic activity(ies) that are measured by success or achievement. Just because we may be seeking the same things as others, does not necessarily mean we have, as the saying goes, “the right Stuff,” to be successful, i.e. – to have the combination of knowledge, behaviors, skills, actions, activities, that when performed effectively in the area in which we have chosen to strive with others, enables us to “fly or rush forward,” to get there first, and secure the prize we seek. Increasingly these days, having the Right Stuff to rush forward in order to get there first and fly away with the prize, first requires “flight school and pilot training.” But before we can fly, we must complete “ground school,” where we explore the relevant, organized body of factual or procedural information (Knowledge), learn the required proficiencies in manipulating data or things (Skills), and demonstrate the power – mental or physical (including the requisite skills)— and behaviors needed to perform an activity or task at a high level of competency (Abilities). Every day most of us try to swim in a Tsunami of what purports to be Information, but it is probably just data, and it certainly isn’t Knowledge. As we prepare ourselves for successful soaring and seizing, we need to understand the “enrichment progression” ocean and hierarchy in which we swim every day. Bit: a digit in the binary number system. It can have two values, 0 or 1. In computer RAM and ROM memory, a bit is a small electrical switch which is either on (value 1) or off (value 0). A bit (short for “binary digit”) is the smallest unit of measurement used to quantify computer data. It contains a single binary value of 0 or 1. When someone brushes off information as “just ones and zeros,” the bit is what they mean. Byte: bits are often grouped together in 8-bit clusters called bytes. Since a byte contains eight bits that each have two possible values, a single byte may have 28 or 256 different values. Computer memory is often expressed in megabytes or gigabytes. Data: raw symbols/factual information that has no significance other than its existence, which can be collected and organized to enable reference or analysis. Knowledge: An organized body of information, usually factual or procedural in nature–collected information with the intent to be useful, e.g. for example, answers the question “how.” The potential meanings inherent in previously unrelated information are given additional value of utility, of being able to be put to a particular use. The now connected information justifies, or makes the case, for our belief in the truth of our conclusions and supports our using them as a basis for decisions or actions. Understanding: Cognitive, analytical state of new knowledge synthesized from previously held knowledge. Wisdom: Connotes predictability based on understandings, in turn, based on previous understandings. Includes the processes of determining right from wrong, i.e. judgment. Adapted in part from the Data, Information, Knowledge, and Wisdom (DIKW) enrichment progression hierarchy proposed by Ackoff (1989), and discussed by Bellinger, Castro and Mills (2004). Similar to the DIKW progression of function and usefulness, combining Knowledge, Skills and Abilities as a progressive hierarchy or “pyramid” of proficiency, suitability and readiness to fulfill job-related responsibilities provides the basis for a much richer, more practical and useful state: Competency. Collectively, KSA’s include the qualities and competencies (ability of an individual to perform a specific function or job) required to perform a job and that are generally demonstrated through qualifying service, education, or training. NPM KSA’s are recognized, observable management or leadership attributes and behaviors that have been acquired or developed through experience, e.g. proficiency, ability, expertness, or technical competence in managing/leading non-profit, charitable-philanthropic organizations. Establishing an adult-centered learning environment specifically focused on providing those competencies identified by practitioners as highly valuable to them as management tools should be a primary objective of any graduate university NPM concentration. The proficient manual, verbal, or mental manipulation of data or things. Skills are the natural or learned capacities (expertise) to perform specific acts, usually with pre-determined results or outcomes. That capacity includes the proficiency, facility and/or dexterity obtained or developed through training and experience. In management education contexts: recognized, observable management or leadership abilities and competencies that have been acquired or developed through experience, e.g. proficiency, ability, expertness, or technical competence in managing/leading non-profit, charitable-philanthropic organizations. The power, mental or physical (including the requisite skills), to do something, typically meaning to exhibit appropriate behaviors (or behaviors that result in an observable product/service) that accomplish something at a high level of competency. Also, qualities that enable a person to accomplish something within a specific environment or situation. In management training and education environments abilities should be validated through the written projects and products prepared by the student, including: SWOT analysis, Strategic Plan analysis, HR/VRM plan analysis, Communications/Marketing Plan analysis, Budget/Financial analysis, and Program Review/Evaluation analysis. The term competence or competency conveys the general meaning of being capable or qualified; adequate, suitable or sufficient for a/the purpose; a synonym is ability. The word is derived from Latin, competens; generally, to be capable of (suitable, adequate, qualified) of competing (striving with others, together in the same activity), as in a contest, match or trial of skills or abilities in which the outcome is measured in terms of success or achievement. Competency includes the ability of an individual to perform a specific function or job. Typically, that job or function resides within an organization setting, and represents a predetermined aggregation of behaviors, actions, activities, that when performed effectively, produce outcomes (e.g., service, product) that are valued/needed by the organization, e.g., contribute in some way to its ability to fulfill its mission and purpose. Thus, competency represents the collective, combined ability of an individual to use applicable knowledge, skills, and abilities to perform a function to an acceptable level of proficiency, especially in conditions or situations where others are performing similar functions. Therefore, demonstrated competencies help validate that an individual has acquired the KSA’s needed for a position or function. Competencies refer to the collective abilities that enable an individual to properly perform a function or a job – to be successful in their positions and/or responsibilities. Competency combines theoretical Knowledge, cognitive Skills, and the acquired Abilities needed by an individual to perform a specific role. In short, competencies include all of the Knowledge, Skills, Abilities, Values, and Behaviors, that have been identified by an organization or professional association as needed by individuals in order to successfully fulfill a position of responsibility. A job represents a collection of responsibilities for actions and activities, the successful fulfillment of which requires an incumbent with the requisite knowledge, skills and abilities. Some jobs or areas of responsibility pertain to environments or situations that are ambiguous or volatile, e.g., emergency services. Competency in these positions requires a different set of abilities, e.g., situational awareness and a repertoire of potential actions and activities needed to bring about the desired outcome. Competencies should be an integral component of a job/position description. In turn, the position description should be aligned with the organization’s purpose and strategic goals. Collectively, when properly defined, aligned with strategic goals and objectives, and practiced by enough people in the organization, core competency(ies) can become an organization’s strategic strength. Competency understanding, clarity and alignment with strategic directions enables organizations to define the behaviors needed within the organization to produce the results needed to achieve organizational performance goals. Competency is the ability of an individual to perform a specific function or job. Typically, that job or function resides within an organization setting, and represents a predetermined aggregation of behaviors, actions, activities, that when performed effectively, produce outcomes (e.g., service, product) that are valued/needed by the organization, e.g., contribute in some way to its ability to fulfill its mission and purpose. Job represents a collection of responsibilities for actions and activities, the successful fulfillment of which requires an incumbent with the requisite knowledge, skills and abilities. Some jobs or areas of responsibility pertain to environments or situations that are ambiguous or volatile, e.g., emergency services. Competency in these positions requires a different set of abilities, e.g., situational awareness and a repertoire of potential actions and activities needed to bring about the desired outcome. Job/Position description. Competencies should be an integral component of a job/position description. In turn, the position description should be aligned with the organization’s purpose and strategic goals. Collectively, when properly defined, aligned with strategic goals and objectives, and practiced by enough people in the organization, core competency(ies) can become an organization’s strategic strength. Competency understanding, clarity and alignment with strategic directions enables organizations to define the behaviors needed within the organization to produce the results needed to achieve organizational performance goals. The term “confidence” is often defined in terms that include the quality of effectiveness, sufficiency, ability, and success. Most sources analyzing competence do so based on the premise that it is an inherent psychological need for human beings. In short, most authorities see the need for competence “… As a fundamental motivation that serves the evolutionary role of helping people develop and adapt to their environment… Individuals learn to direct this general motivational energy using concrete, cognitively-based goals and strategies…Learn to use self-regulatory tools to channel their general desire for competence toward specific outcomes and experiences that satisfy the competence need” (Elliot & Dweck, p. 6). Significantly, competence-related behavior also includes motivations to avoid the negative outcomes and emotions generated by possible incompetence. Confidence motivation and competence achievements have a substantial impact on our emotional profile and self-concept. When our efforts to improve our competency results and success, we experience happiness, joy, and pride. Negative outcomes on the other hand, can bring anxiety, shame, and sadness. While we may experience different levels of competence motivations across our lifespan, typically competence motivations begin at birth with our desire to explore and control our environment. As we reach adulthood, our competence motivations and standards grow more challenging and complex as they interact with other motivational concerns, e.g., self-preservation. As we reach late adulthood, typically, our competence motivations are challenged by declines in our skills and abilities, but even more typically by the subtle pressures of society to exclude and marginalize older workers. Nevertheless, throughout our lifetimes competence motivation remains an important contributor to our overall behavior and well-being. While competence motivation can be seen in all cultures, it may be expressed and manifested differently depending on the culture. Competence is generally understood to be a basic psychological need that has a significant impact on our behavior, regardless of age or culture (Elliott & Dweck, 2005). Competency development can be seen as an ongoing process of acquiring and integrating the knowledge, skills, and demonstrated abilities (KSA’s) needed to perform successfully in one or more of the life domains at or above the journey man-level. When these KSA’s are further honed through practice and experience to high level of mastery in one or more domains, we can become experts in that area, e.g., Subject Matter Experts (SMA’s). However, he points out that development of competencies or expertise in one domain or area does not necessarily provide competencies or expertise in another area, although in some cases there is some degree of transfer. The overall process of acquiring important competencies needed for career advancement and success is labor intensive and therefore time-consuming. Therefore, it is all the more important that programs preparing management professionals in a particular field focus on competency acquisition and not simply the acquisition of knowledge. Most academic institutions focus on the acquisition of declarative knowledge, i.e., facts, principles, concepts. However, achieving competence requires more than simply “knowing about” an area of management or other topic. Of equal, and some would argue even greater, importance is “knowing how” (procedural knowledge), and further, that “knowing how” (knowledge and skills) has been validated in a way that demonstrates ability – KSA= Competency. Also highly important since the process is so labor intensive, is that programs of study and preparation emphasize the acquisition not simply of any competencies that might possibly relate to the field, but those competencies that have been validated and ranked by senior (e.g. successful) practitioners as being most contributory to career success in that field. Ackoff, R. L. (1989). From data to wisdom. Journal of Applied Systems Analysis, 16, 3-9. Elliot, A. J., & Dweck, C. S. (2007). Handbook of competence and motivation. Guilford Press. Schunk, D. H., & Pajares, F. (2005). Competence perceptions and academic functioning. In A. J. Elliott & C. S. Dweck (Eds. ), Handbook of competence and motivation (pp. 85-104). New York, NY: Guilford Press.